This is The Plantation Garden in Norwich. It is a fine example of a surviving Victorian Town Garden. The gardens are next to the Cathedral Church of St John the Baptist, accessed via a gate on Earlham Road. There was no staff there, but you have to pay £2 into an honesty box (an old Victorian letter box). 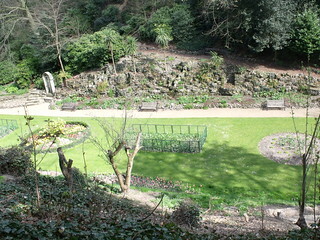 The garden was set up in the late 19th century by Trevor Page. The path from the top of the garden to The Beeches Hotel. There was no wall up this section, so you had to be careful here. The Plantation Garden is a grade II listed English Heritage registered garden. It was created by Henry Trevor between 1856 and 1897. The garden fell into disrepair by 1980. The Plantation Garden Preservation Trust was formed to save and restore the garden.